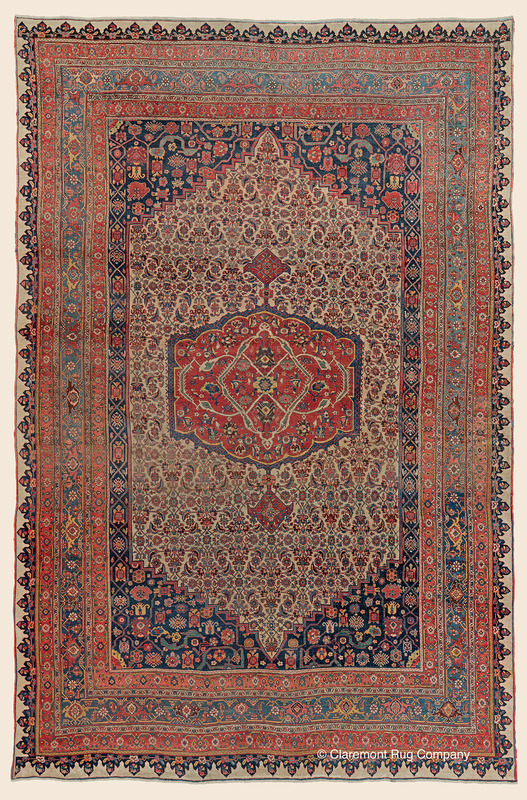 Search Our Inventory / All Rugs / 9&apos; 4" x 14&apos; 1"
9&apos; 4" x 14&apos; 1"
This antique large room-size from the town of Bijar famously nicknamed the "Iron Carpet of Persia" offers a traditional Persian design illumined with upbeat mango, persimmon, and marine blue hues. Within its field, an elongated, shield-shaped inner reserve contains an beguiling all-over pattern of diminutive leafs and blossoms devices enhanced by dazzling waves of abrash (artistic color striation) that ebb and flow through theis latticework design. A sophisticated border suite offers its own highly refined design and color striations as they unfurl throughout the framework of the carpet.